This month, the Rites of Spring Pagan Celebration in New England will be ten years old, making it one of the oldest continuous Pagan gatherings anywhere. 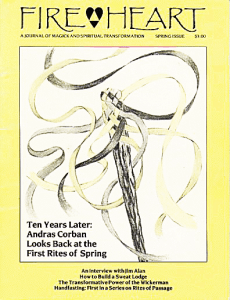 From its comparatively humble debut over Mother’s Day weekend in May 1979, Rites of Spring has evolved into a week-long event involving more than five-hundred from all over the country as well as Canada, and including participants from as far away as England, Germany, France and Australia. When asked by the editors of FIREHEART (as the festival’s originator and one of its current organizers) to provide a retrospective article on Rites of Spring, I thought it would be interesting instead of explore how an ongoing event such as Rites can mirror the changes, issues, and growth of contemporary Paganism, and provide a perspective on important themes and currents within the Pagan community. The idea to organize Rites of Spring came to me while participating in a small gathering of covens near Baltimore in April of 1978, sponsored by an organization called Keepers of the Ancient Mysteries. I attended this event as part of a three-person delegation from another organization, the Massachusetts Pagan Federation (MPF), which had been formed several months before as a networking association of some two dozen covens and Pagan groups in Massachusetts. The gathering in Maryland was primarily a local event for the covens associated with K.A.M., and I wondered what it would be like to do something similar, but on a larger scale, inviting Pagans from all over the country to participate. At a subsequent meeting of the MPF I proposed this idea, and was commissioned by the other members to organize the gathering. Having little sense of what such an enterprise required, and lacking any models to emulate, I spent the following months collecting addresses and writing and calling Pagans throughout the country to ask for their input and invite them to the gathering. This proved to be a thankless task. The Pagan Community was not nearly as accessible then as it is now, even for an “insider.” Most of my attempts to contact people went unheeded, and, of those who did reply, many thought that the gathering was a bad idea. Either their group was happily underground, or they felt uncomfortable being in circle with people from other traditions. There were some who felt that such an event violated traditional Craft “laws” regarding permissible contact among covens, and rendered us vulnerable to outsiders: the impending revival of the Inquisition would like nothing better than to catch a bunch of Witches and Pagans banded together at the same place and time. That first Rites of Spring was held over Mothers’ Day weekend at a sheltered picnic site in Prospect Hill Park in Waltham, just outside Boston. We had use of the site from morning till dusk, at which point everyone went home and returned the next day. Those who came from out of town were provided accommodations in local Pagans’ homes. The food was potluck, and plentiful. Toilet facilities were readily available – any secluded spot in the surrounding woods did the trick. There was no registration fee of any kind: photocopying and mailing expenses and the $8/day site rental fee were paid out-of-pocket by MPF members. All told, over 100 Pagans made an appearance during the weekend. The day before the event was to start, as I drove Memorial Drive on the way from picking up some early arrivals at the airport, I noticed a man playing bagpipes by the banks of the Charles River. Impulsively, I made a hasty and illegal U-turn, and approached the man when he finished playing. He said he was a professional musician, and that he’d be willing to play at the gathering. His fee, however, far exceeded my meager personal savings and our non-existent festival budget, so I bid him my regrets. As we drove on, I explained what had just transpired to my bemused and rather puzzled riders. Nice idea, they said…too bad it hadn’t worked out. That night, due to the inevitable last-minute complications, I got to bed after four in the morning, and woke two-and-a-half hours later in an unsuccessful attempt to get to the site by the scheduled starting time of 7 a.m. (Yes, you read that right, and there actually were people there by 7 a.m …. ) After executing my opening duties, and once I felt the gathering was under way, I wearily returned home for a much-needed shower and a quick nap. I groped my way into the bathroom, and found, to my surprise, that the shower was running. It occurred to me, in my somewhat groggy condition, that my lover must have known that I would want to take a shower when I came home, and had thoughtfully set everything up for me. “How nice of her,” I thought, as I pulled aside the shower curtain. I was suddenly wide awake: there stood a tall, blond, wet, bearded stranger enthusiastically lathering himself in my shower! “Hi, you must be Andras,” he said with a big smile, proving that the somewhat pluvial surroundings had not at all dampened his good spirits. At the site, I dropped Isaac off a few hundred yards away, with instructions to give me a few minutes head start before he began playing. I parked my car and rejoined the gathering, which had grown considerably during my absence. A workshop was in progress and everyone was listening intently to the speaker. Suddenly, seemingly out of nowhere, came the faint sounds of a bagpipe. People looked around, surprised, trying to figure out what was going on. And there he was: a golden lion of a man radiant in the morning sun, purposefully striding over the hill and through the woods, playing his pipes while the ferns just parted before him, as if bowing to a god. He stopped at the edge of the our circle, and for several minutes the only thing that mattered in the world was the tune of a traditional Scots reel droning in our ears and in our very blood. When it ended, all that any of us could do – even I, who had known what was coming – was to sit there, openmouthed and silent, taking in a magical apparition that might as well have come from the realm of Faerie. Not even my dream could do it justice. The Pagan community has undergone a great deal of change since that May weekend in 1979, and nowhere have these changes been more apparent than at the gatherings. Indeed, a strong case can be made to support the view that the gatherings themselves have been the major source of these changes. The first edition of Drawing Down the Moon, published in the Fall of 1979, contained little mention of Pagan festivals. By the time she revised the book in 1986, author Margot Adler claimed that festivals “have completely changed the face of the Pagan movement,” and that their proliferation constitutes “the one most enormous and striking change that has occurred since Drawing Down the Moon was first published.” In the late 1970’s, Pagan gatherings were, for the most part, small and sporadic events with a narrow geographic or thematic focus. A decade later, each region of the country boasts at least one large, ongoing, “ecumenical” festival involving hundreds of participants, and there are dozens of smaller gatherings nationwide. The evolution of Pagan festivals around the end of the last decade coincided with the publication of Drawing Down the Moon and Starhawk’s The Spiral Dance, easily the two most influential works in recent Pagan literature. These books, by de-emphasizing the “occult” label that had previously characterized the modern Craft, and by focusing instead on its spiritual and socio-political aspects, succeeded in exposing and attracting new segments of the mainstream society to Paganism. For these newcomers, the gatherings provided an accessible vehicle to connect with like-minded people. This combination of factors has resulted in the most visible and perhaps most important change to occur within the Pagan community in the last decade: a dramatic increase in size. Attendance at Rites of Spring, for example, has grown more than five fold over that period, a rate which seems typical for large Pagan gatherings. The EarthSpirit Community, the Pagan network which sponsors Rites of Spring, started out some eight years ago with a mailing list of about a hundred people. Today, we are in touch with over a thousand Pagans in the New England area alone. These figures pale by comparison to Circle, the largest Pagan network, which has tens of thousands of people on its mailing list. The increase in numbers has been a major contributing factor toward greater eclecticism within Paganism. The new members of the community represent a much wider social spectrum than ever before, and therefore, a much larger pool of interests and resources. The gatherings, by bringing such a diverse array of people together and exposing them to each other, contribute an ongoing vehicle for eclecticism to flourish. Contemporary paganism has come to include intriguing syntheses of European, Oriental, Afro-Caribbean, New Age, and Native American practices. workshops, rituals and networking sessions for politically-active Pagans. These changes have not taken place without conflict, however. A certain rift has occurred between the longer-standing, more “traditional” members of the community, and the newer, more eclectic members. The traditional groups, in general, tend to be more formal and structured than the newer groups. For the most part, they have a hierarchical leadership, a graded system of initiation, a specific form or style of working, and are fairly secretive about their practices. Many (and possibly most) of the traditional groups do not attend Pagan festivals, and when they do, they tend to keep to themselves. The openness and eclecticism prevalent at gatherings runs counter to traditionalist approaches to the Craft, which, in turn, are often considered “politically incorrect” by many of the newer activist Pagans. The end result is that the voices and concerns of some of the most knowledgeable and longest-standing members of the Pagan community are seldom heard in the influential forums at Pagan gatherings. Some of the strongest concerns raised by members of traditional groups have to do with the dilution of identity and values, and the increasing lack of substance they perceive in the Pagan community. Many traditionalists feel that Paganism has grown too big, too fast, and too indiscriminately; that new members whose main affiliations lie with socio-political “special interest groups” have polarized rather than enhanced the Pagan community; and that the eclectic approach has resulted in a watered-down Paganism that is one step short of joining “channeling”, crystals and shamanism as the latest New Age fad. One focus for such criticism is the level of magic and ritual found at Pagan gatherings. Several years ago, while attending a Midwest festival, an acquaintance of mine griped about this very subject: “It’s so frustrating,” he said, “Here we are, 350 Pagans from all over the country – you would think we could really cook together. instead, we do a few OMs, a little drumming, and the ‘Pagan Top Forty’ chants. It’s … boring!” It was hard to disagree with him. I, for one, have never come even close to experiencing in a ritual at a Pagan gathering the same level of magic and psychic intensity that I generally do on my own or working with my coven. The problem, however, does not lie so much with the organizers of rituals as it does with the very dynamics of a gathering. to create a meaningful, actively participatory ritual for five-hundred people ranging from practitioners with twenty years of experience to complete beginners, and representing a wide array of traditions, styles and assumptions, is an extremely tall order. To be effective, the ritual must address the lowest common denominator present; it must speak the simplest language if it is to be understood by all. Because of the continuing influx of new Pagans, however, the lowest common denominator stays the same. Hence, rituals at gatherings frequently degenerate from the simple to the vapid, from the anticipated to the predictable. One alternative is to have graded rituals for different levels of experience (i.e., some for beginners, some for advanced practitioners). This approach, besides making newcomers feel like “second class citizens” and fragmenting the community at the gathering, has one fundamental drawback- who (and using what criteria) gets to decide who belongs in which ritual category? Another alternative would be to try to raise the lowest common denominator by offering at the gathering mandatory workshops on ritual technique and symbology for those wishing to attend a particular ceremony. This strategy has been tried at several gatherings with mixed results. One problem is the almost impossible task of monitoring whether people participating in the ritual have actually attended the preparatory sessions. Another problem stems from the simple fact that a quick workshop on ritual techniques is not likely to transform an inexperienced beginner into a seasoned practitioner. The use of ritual theatre as a basis for large ceremonies is the most effective approach we have yet found for use at gatherings. Theatre and ritual have been closely intertwined since antiquity; in most cultures, the earliest theatre was hieratic – it was used to dramatize sacred concepts and situations. Ritual theatre, if skillfully performed, can provide an effective focus for a large crowd. If those in charge have little skill in or sense of theatre, however, the ritual can fall as flat as a mediocre high school production. This is oftentimes the reason why a ritual that has been very effective in the confines of a small coven fails abysmally when performed at a large gathering: the people leading it, however experienced ritually, may not know how to block, or move, or project and modulate their voices to accommodate several hundred people in a large open space. Another effective tool is the use of large-than-life symbolic props which provide a strong visual identification and stimulate the participants’ concentration. Over the years, some of the most successful rituals at Rites of Spring have centered around such images: a wicker figure, the Maypole, a bifacial Goddess puppet, a gigantic multi-colored web, an earthen Great Mother protruding from the ground. As gatherings grow larger, we will have to devise more creative and effective ritual forms. One thing that many festival organizers agree upon, however, is the need to have ritual remain inclusive and participatory in order to develop the sense of community that most festivals strive to achieve. This concern with developing community is a growing current within Paganism that has largely evolved through the festivals. A good measure of a successful gathering is that its participants don’t want it to end. Comments such as: “Wonder what it would be like to live like this all the time…” or, “How can we go home when we are home?” are frequently heard at the conclusion of many Pagan gatherings. Some festival organizers have responded by extending the length of their gatherings and by structuring them so that the feel of being in an actual community is emphasized. The interest in community-building has spilled out from the gatherings as many Pagans. dreaming of the future, have attempted to maintain such an environment on a more permanent basis. Reflecting on the numerous conversations that I’ve had with other people at gatherings over the years, I am struck by the fact that we have invariably talked about the past (ancient traditions, our personal histories) or the present (issues of immediate concern, or the latest gossip), but very seldom have we discussed the future. Yet, over the last couple of years, I’ve been privy to several conversations that focused on where we’re going to be twenty-five years from now. Many Pagans are doing just that. If, as Margot Adler asserts, the festival movement has been the most important change within Paganism in the 80’s, it would not be surprising if the next major transition in that direction were to be the establishment of full-fledged communities. Several intentional, land-based Pagan communities have been organized over the last decade, with varying results. Others, like the EarthSpirit Community exist as extended networks whose members meet regularly through gatherings, programs, and open circles. As these communities have developed, Pagans have increasingly had to confront some difficult and volatile issues. In order to function effectively, a community needs some kind of definition and purpose; a sense of direction; some structural guidelines covering decision-making and organization; and resources: people, skills, property, money, etc. The Pagan community comprises an incredibly varied aggregation of people, many of whom are extremely independent, iconoclastic, even anarchistic. In my experience, it has generally been a very strenuous and convoluted process for any sizable group of Pagans to reach agreement on some of the fundamental criteria of a working community. There have invariably been too many divergent opinions, too many mutual suspicions that get in the way. A lot of Pagans are wary of organizations and structures, of people assuming leadership roles or trying to tell them what to do, of “rules,” or money changing hands, or commercialism. They have seen too much abuse, too much hypocrisy, too many scams. One frequent bone of contention is money. Many branches of modern Paganism have specific injunctions against charging or even accepting money for any activity involving their religion. For a great number of Pagans, financial transactions that involve what could be termed “sacred services” (e.g. teaching, counseling, healing) only serve to corrupt and prostitute our spiritual values. This attitude is commendable for its altruism and valuable for its honesty. In many ways, however, it has contributed to the impermanence of modern Pagan institutions. A sizable number of festivals, publications, and networks have folded after a short time due to burn-out on the part of their volunteer organizers, who found it impossible to juggle them with family, career, social life, school, and other parts of their lives. Had these people been able to make a reasonable living through their Pagan-related activities, their valuable efforts might have been enhanced, rather than cut short. There are signs that Pagan attitudes toward money are changing. When, for the third Rites of Spring, we finally decided that we had to charge admission ($ 10 for the whole weekend), there were quite a few Pagans who angrily boycotted the gathering, feeling that they were being “ripped off.” Just a few months ago, when I mentioned to someone that the cost for this year, including food, would come to $140, her reply was: ” That’s all? For a whole week? A New Age conference would charge twice that just for a weekend!” indeed, it appears that a certain affluence is slowly infiltrating the Pagan community: at last year’s Rites of Spring, for instance, those attending spent over $12,000 just buying wares from pagan merchants. In a money-based society, a community needs some kind of financial solvency and stability if it is to survive as such. Pagan communities will need to develop realistic ways of dealing with money without compromising honesty and ethics. Bartering goods and services among ourselves is one strategy. Pagan-owned businesses or cottage industries that put a percentage of their profits into helping the community is another. So are free admission in exchange for work or outright scholarships to Pagan gatherings for those in financial need; a community money-pool to help its members who have lost their jobs or don’t have enough to pay hospital bills; or tithing Pagan organizations or individuals whose work is valued. If we are going to create functioning, viable Pagan communities that will not only provide us with Nature sanctuaries and sacred groves for the practices of our religion, but also with places to live, schools to raise our children, and the means to support ourselves, and care for our elderly, and sponsor our writers and artists, then we will have to openly discuss and find agreement on these issues. in the meantime, the festivals will continue to provide us with periodic tribal villages, and serve as ongoing vehicles for the exploration of new directions in the Pagan community. ANDRAS CORBAN ARTHEN a member of the Board of Directors of the EarthSpirit Community, and a frequent contributor to FireHeart.